Amazon.com Inc. (AMZN.O) just reported US$232.9 billion in annual revenue, crossing the US$200 billion mark for the first time. It’s an impressive feat that few companies have accomplished. And in Amazon’s case, it took less than 25 years to make it happen. It’s no secret Amazon has always prioritized growth at the expense of profits. The e-commerce giant has plowed billions of dollars into its online operations. That helped the company secure nearly 50 per cent of total e-commerce retail sales in the U.S. last year, according to market research firm eMarketer. Couple that with its strong market share in cloud computing through Amazon Web Services, and Amazon has a highly effective one-two revenue punch. Amazon was founded in 1994, when CEO Jeff Bezos started the company in Seattle, with the hope of capitalizing on the early growth in e-commerce sales. With its new milestone, Amazon has reached the US$200 billion mark only 24 years after launching. Still, Amazon has a long way to go to catch up to one of its chief rivals, Walmart Inc., which generated more than US$500 billion in revenue over the last 12 months. 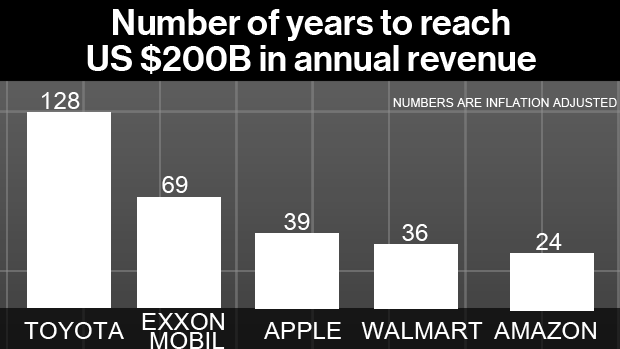 To put Amazon’s accomplishment in context, it took Walmart 40 years to reach US$200 billion in annual revenue. If you factor in inflation, Walmart reached the milestone in 36 years, which is still more than a decade longer than Amazon. In Apple Inc.'s case, the company needed 15 more years than Amazon to reach US$200 billion a year in sales. What’s even more astounding is that analysts on Wall Street expect, on average, that Amazon may double its current sales numbers by 2022. If their calls are correct, Amazon's revenue ride might not be over yet.